Coffee is one of the world's most popular hot beverages thanks to its ability to "awaken" the brain and improve alertness. Learn more about its full potential here. The origins of coffee can be traced to Ethiopia, in the Horn of Africa, where it has been used since ancient times as a healing agent, especially against stomach illnesses. Nowadays, the roasted beans of this shruby tree are used in a wide variety of products, but mainly consumed as one of the most popular brews throughout the world. 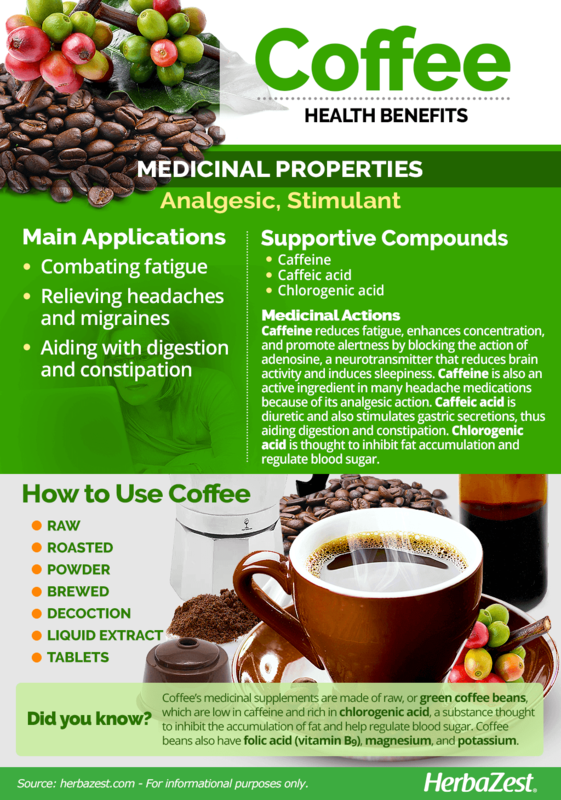 The various medicinal benefits of coffee still being explored and studied, though it continues to be preferred as a hot beverage, renowned due to its ability to boost energy levels and stave off tiredness, and enjoyed because of its rich, bitter taste. Combating fatigue. Coffee possess stimulating properties and is able to improve the levels of stamina, as well as the ability to concentrate. Relieving pain. The analgesic benefit of coffee is also used in medications to relieve the pain caused by headaches and migraines. Additionally, the digestive effects of coffee stimulate bowel movements, thus helping relieve constipation. Coffee has a special place in traditional Chinese medicine, where its bronchodilator, astringent, antipyretic, and cardioprotective properties have been used for treating asthma, chronic diarrhea, malaria, fever and irregular heartbeat (arrhythmia). The main active ingredient of coffee is caffeine, a bitter alkaloid with a stimulant action on the central nervous system. Caffeine can sharply reduce physical fatigue, enhance concentration, and promote alertness by blocking the action of adenosine, a neurotransmitter that is meant to reduce brain activity and progressively induce sleepiness in response to physical exertion. Caffeine can delay the accumulative effects of adenosine for approximately five hours. It is well known that coffee have a strong effect on the gastrointestinal system, stimulating secretion from the stomach and the small intestine. The caffeic acid, a major phenolic compound in coffee, is responsible for its digestive and diuretic properties. It has not only antioxidant effects but it also stimulates gallbladder contraction and colonic motor activity. The effects of caffeic acid on the colon are comparable to those of a 1000 kcal meal. Caffeine is a key active ingredient in many headache medications because of its inhibiting action over adenosine. Adenosine levels in the blood go up during migraine attacks, and its many effects includes a diminished brain electrical activity, increased blood pressure, sleep disorders and altered motor activity. Adenosine acts by sticking to specific receptor molecules on the surfaces of some brain cells. By blocking the action of these receptors, caffeine can stop the effects of adenosine. The nutritional value of coffee beans, however, is also worth mentioning, as they contain plenty of folic acid (vitamin B9), magnesium, and potassium. Trace amounts of calcium, phosphorus, and riboflavin (vitamin B2) have also been found inside coffee beans, although their proportion varies greatly depending on the variety of the bean, the growing conditions, and the form of preparation. COFFEE IS RECOGNIZED AS ONE OF THE MOST SIGNIFICANT SOURCES OF ANTIOXIDANTS IN STANDARD AMERICAN DIET. Guarana and tea plant also possess stimulant properties, whereas chili pepper and devil's claw offer similar analgesic benefits. If coffee is consumed in the appropriate amount, one may not need to worry about side effects. However, overconsumption of the active ingredient, caffeine, can lead to headaches or dizziness, insomnia, rapid heart rate, dehydration, anxiety, and shakiness. Caffeine sensitivity varies from person to person. Coffee promotes gastric acid secretion and gastro-esophageal reflux, so it would be better for people with gastritis to stay away from it. Large amounts of caffeine may stop the absorption of calcium and lead to osteoporosis. Coffee induces gallbladder contraction, so people with renal problems and gallstones should avoid it. Coffee may also interact with some medications, including psychiatric medications, bronchodilators, and calcium supplements. Coffee has been associated with an increased risk of babies being small for gestational age (SGA). Although the recommendation in the U.S. is to keep its consumption below 300 mg per day during pregnancy, it is strongly advised to avoid it altogether. Caffeine increases blood pressure when five cups of coffee or more are consumed daily. That effect is enough to justify counseling high-risk patients to moderate their caffeine intake. Caffeine should be taken generally in moderation since it can cause dependency. FDA HAS ESTABLISHED 400 MILLIGRAMS DAILY AS A SAFE AMOUNT OF CAFFEINE FOR HEALTHY ADULTS. The best way to take full advantage of coffee's benefits - both nutritional and medicinal - is drinking it as a hot infusion. However, as its bitter taste and high liquid volume can be off-putting to some, and in order to enhance the effects of some coffee natural actions for medicinal purposes, tablets are the most effective way to consume it. COFFEE ROASTED BEANS ARE MOST COMMONLY CONSUMED AS A HOT INFUSION. Either brewed freshly ground for a classical American coffee or finely ground for an espresso, drinking coffee is the most popular way to consume it in order to reap its antioxidant and nutritional benefits. Roasted. After being sun dried, coffee beans are roasted and can be consumed that way as snacks, usually covered in chocolate, or brewed. Powder. The dried and roasted coffee beans are ground to different levels. Both roughly ground coffee and finely ground espresso coffee are preferred ways of consumption world wide, and they offer the same stimulating and antioxidant effects. A regular cup of coffee offers 95 mg of caffeine and 116 mg of potassium, among other beneficial components in smaller amounts. Even when the fat burning effects are not significant, coffee supplements are commonly regarded as weight loss supplements. However, the high caffeine concentration in green and roasted coffee beans helps to reduce appetite and increases concentration. Both liquid extracts and tablets are made of raw coffee beans, popularly called green beans, which don't have the same antioxidant power of roasted coffee but offer higher levels of chlorogenic acid, responsible for inhibiting the accumulation of lipids and regulating blood sugar. Raw coffee is usually sold as "green" coffee, and it is readily available to order on the internet or to be purchased at more specialized stores. The coffee bean is the seed of the coffee plant, and green beans have been processed to remove the outer pulp and mucilage, but maintain a waxy layer on their outer surface. Roasting coffee reduces its shelf life, so it is usually roasted near the time it is intended to be sold. The most common way to purchase coffee is in its roasted form. Some people roast their own coffee after buying the raw, green coffee beans, but the majority of coffee drinkers prefer to purchase their coffee already roasted. Coffee supplements are commonly available for purchase in online retailers, and may come blended with other herbs, namely raspberry ketones and garcinia. While coffee supplements are often marketed for weight loss, these claims are not substantiated. The natural habitat of coffee is tropical rainforests, although it grows best if the humid and hot climate is combined with some altitude. The coffee plant has a life cycle of seven years, and it takes approximately four years for it to reach the stage where it will produce yields that are significant enough to be economically viable. Coffee is usually grown under shaded conditions but may be grown in full sun. Optimum growing conditions include temperatures from 59 - 75°F (15 - 24°C), high humidity, and protection from windy conditions. Coffee plants may be damaged or killed by freezing temperatures. Coffee grows best in well-drained, slightly acid to neutral-pH soils with a high organic matter content. However, coffee will withstand high-pH soils. Arabica coffee (C. arabica) flowers are self-fertile, and varieties can be grown from seeds, which should be grown in nurseries before they are transferred to fields, but robusta coffee (C. canephora ) and hybrids must be propagated by stem cuttings. Coffee plants that will be pruned periodically to limit their height may be planted 5 - 15 feet (2 - 5 m) from much larger trees or buildings. Pruning is necessary for optimum fruit production and maintaining a small tree. Coffee should be fertilized with a complete dry fertilizer mix including nitrogen, phosphate, potash, and magnesium. Newly planted and young plants should be watered regularly to stimulate strong, healthy growth. Once the plant is large enough to flower, watering should be controlled. Vegetative growth and flowering are controlled by soil moisture. Watering should be reduced or eliminated during the late winter (January - February) and re-initiated during the spring (March - April) to induce flowering and fruit production. A grass-free area about 2 - 5 feet (1 -1.5 m) away from the trunk of the plant should be maintained to avoid injury caused by lawn mowers and weed eaters. Various insects, including stem borers, leaf miners, mealy bugs, scales, and mites, have been reported to attack coffee leaves, stems, flowers, and fruit. A number of fungi attack coffee leaves, stems, roots, and fruit, especially if coffee plants are grown as a part of a diverse number of species in the home landscape, and not as a monoculture. 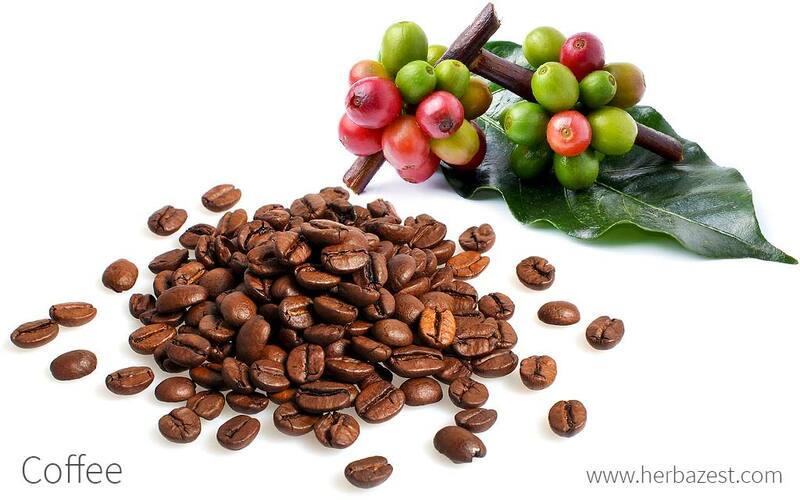 Coffee is generally harvested when the berry turns from green to red. The coffee three is small, 7 - 30 feet (2 - 9 m) tall, with horizontal large branches and cherry-like fruits that grow in clusters along them. Its leaves are evergreen and usually shiny. When grown for commercial purposes, it is usually pruned to take the form of a small shrub. Coffee is a member of the Rubiaceae family, a family of flowering plants that also produces quinine and is of substantial economic importance. Over 13,000 species are members of this family, including cleavers (Galium aparine) and cat's claw (Uncaria tomentosa); however, Coffea arabica is the most economically important and the most widely cultivated species of the Coffea genus, accounting for between 75 - 80% of coffee's world's production. Although there are over 70 species of coffee, only three of them are commercially cultivated nowadays: C. arabica, C. canephora, and C. liberica. Over the course of history, different varieties and subspecies of coffee have been cultivated through selective breeding in different regions of the world. Coffea arabica contains less caffeine than other species in its genus, and it is subdivided into three main varieties: Coffea arabica var. arabica, var. bourbon, and var. typica. Out of these varieties, many cultivars, hybrids, and blends have been developed, such as 'Caturra', 'Mundo Novo', 'Tico', 'San Ramon', and 'Jamaican Blue Mountain', among others. Most instant coffee is made from a mixture of C. arabica and C. canephora, the latter having a less delicate flavor and aroma, and higher concentration of caffeine. Although the coffee plant originated in the African country of Ethiopia, the first mention of coffee beans being roasted can be traced back to southern part of the Arabian Peninsula in the 9th century. The earliest verified records, around the 15th century, point to coffee being ritually used as a "consciousness enhancer" in Sufi shrines of modern Yemen, which led to its rapid spread to the rest of the Middle East and Asia Minor, and from there into Europe and the Americas. Coffee is currently one of the most important crops in the world, constantly competing against green tea as the international hot drink of choice. The overwhelming majority of coffee - over 90% of it - tends to be produced by developing countries, with Brazil currently occupying the spot of top coffee producer. In 2004, 12 different countries had coffee as their top agricultural export. Over 2.25 billion cups of coffee are consumed in the world every day. Gardening. Coffee beans can be used as a nutrient source for plants such as rosebushes, evergreens, and azaleas. Alimentary industry. As well as a beverage - energy drinks and soft drinks - coffee is used for flavoring foods and confectionery, such as candies, snacks, gum, and syrups. The beans are also a commercial source of caffeine, a by-product of making decaffeinated and instant coffee. Agroforestry. Coffee has been successfully used to repopulate deforested areas around the world where the environment is suitable for this crop, particularly tropical and semi tropical rain forests. Coffee plants can be grown in the same field as palms, papaya, cacao, or timber. Stain removal. Coffee beans can also be used as a scouring agent for greasy or grimy stains. Beans that are steeped in water can be applied to scratches on furniture to make them less noticeable.